PASCOE Vale finds itself inside the Strathmore Community Bank Premier Division top four after easily accounting for the Kyle Hardingham-led Essendon Doutta Stars on Saturday. Matthew Watson booted three goals and was well-supported by the likes of Jordan Cellini, Josh Cauchi and Dean Clare as the Panthers broke away from the Stars in the second quarter at Martin Reserve. By halftime the margin was out to 35 points and Pacco never looked back, cruising its way to a 43-point win. Ben Allan and Liam Ogden are both proving their worth as high-quality midfielders and were named the two best players on the ground, while former Liston Trophy winner Jordan Schroder was at his usual best for the visitors. The Stars are just one spot below Pascoe Vale on the table in fifth place heading into the Easter break. CRAIGIEBURN had no trouble filling the Dean Limbach void against Tullamarine on Saturday. Last year’s Division 1 leading goal kicker was absent for the Eagles’ 2019 season-opener, but that didn’t impact the scoring prowess of Lance Whitnall’s men, as they eased their way to a comfortable 46-point win. John Bellino led the way inside 50 with five goals for Craigieburn while former skipper Brent Gordon and new recruit Steve Boyall booted three each. The Demons went into the game undermanned, with tall Adam Scott and midfielder Anthony Liberatore both missing from the Round 1 side that defeated Westmeadows. Inaccuracy in front of goal plagued Tullamarine throughout the day and their final score 10.21 may have cost them a chance of being in it late. Caleb Harward and Brad Allen each kicked two goals. THE game of the weekend was at Coburg City Oval, where West Coburg and Westmeadows played out a thriller. In perfect conditions, both sides hit the scoreboard effectively and often, making for a high-quality contest on EDFL Match of the Day. The Burgers led by eight points at halftime and four at the final change, but the Tigers finished the game well. Led by Tom Muscat and former Burger Omar Saad (four goals), Westmeadows outlasted West Coburg in the final term with four goals to three and managed to stay ahead by the time the final siren rang, signalling a three-point win... its first for 2019. Coach Dale May was among West Coburg’s best with three goals. Both sides are now 1-1 on the season. EAST Keilor is continuing to make waves in Division 1 after smashing Roxburgh Park at Overland Reserve. Dion Hill returned to form in a big way, booting 10 goals as the Cougars ran riot over the newly-promoted Magpies, going on to score a huge 185-point win. In total, 13 of the 22 Cougars on the park got among the goals, with Hill and Josh Grabowski (three goals) named the best players on the ground. After beating Taylors Lakes by 135 points last week, the Cougars boast a ridiculous percentage of 607.94 after two rounds and will not have to face fellow Division 1 contenders Tullamarine and Craigieburn until Rounds 7 and 8 respectively. For the still winless Roxburgh Park, skipper Harley Short was named best. ANOTHER eight-goal haul from star forward Josh Covelli was enough to see Burnside Heights topple Moonee Valley at Ormond Park on Saturday. Covelli now has 16 goals from his first two games of the year and proved an unstoppable force for Shanon Carroll’s back line on the weekend. The Fog, playing in its first game for 2019, held slender leads at the first two breaks before the Bears stormed clear in the third with 10 goals to two, putting the game beyond doubt by three-quarter time. Fellow 2018 Team of the Year inductee, Anthony Fawcus, was the main support act to Covelli up forward, booting three goals in what ended up an impressive 20-point win for the Bears. New recruit Rocky Ferraro looked good in his first outing in black and white, kicking four goals for the Valley. The Bears enter the Easter break undefeated and in third spot on the Strathmore Community Bank Division 2 ladder. THE Sunbury Kangaroos are on top of the Division 2 ladder after claiming victory in the inaugural ‘Sunbury Derby’ on Saturday evening. The Roos asserted their dominance over East Sunbury early at Eric Boardman Reserve and had five goals on the board to the Thunders’ one by quarter time. After adding four more unanswered goals in the second, the game was already beyond doubt by halftime. Lachie Baddeley ended the night with four goals for the hosts alongside Josh Burgess, who led up well throughout the game. Lucas Shaw was East Sunbury’s best with one goal on what was a tough night for last year’s runner-up, after losing Tom Cree pre-game to a minor hip injury. The Thunder remains winless for 2019. THE Sunbury Kangaroos made it a double, claiming victory in the other ‘Sunbury Derby’ of the weekend. This time it was the Kangaroos’ EDFL Women’s - Premier side that collected the four points after easily accounting for the Sunbury Lions on Sunday. 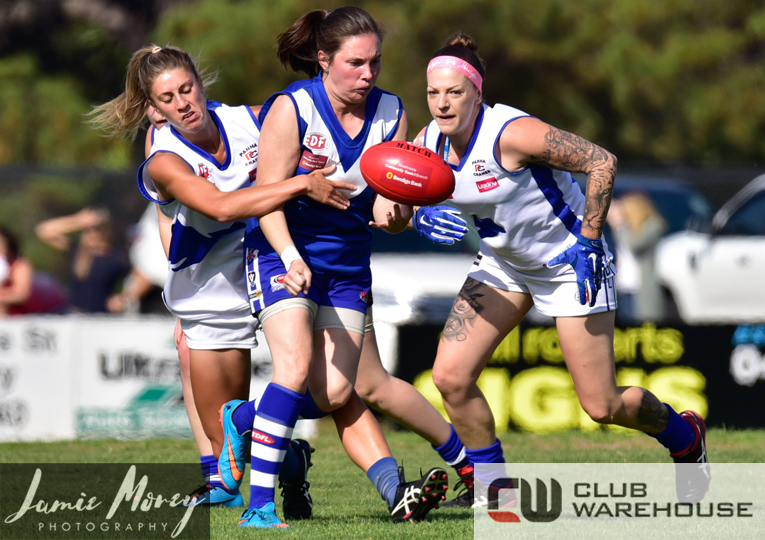 Regina Said starred up forward with four goals alongside last year’s EDFL Women’s medal winner, Bailee Said (three goals), as the Roos kept the Lions goalless from start to finish. The margin was 71 points by halftime before the Kangaroos took their foot off the gas in the second half, going on to claim their first win of the season by a margin of 89 points. Tara McKean was named best-on-ground for the fourth-placed Kangaroos. ROXBURGH Park is sitting pretty at the top of the EDFL Women’s - Division 1 ladder after taking care of Avondale Heights on Friday night. The division’s leading goal kicker, Rainbow Ebert, booted two goals alongside Katelyn Birmingham and Sarah Mazzucco as the Magpies clinically took care of business away to Avondale Heights. On its way to eight goals for the night, Roxburgh Park kept the Heights to just one major, which came in the third quarter off the boot of star youngster, Rita Ceravolo. The 50-point win leaves Roxburgh Park as the only 2-0 team in Division 1 heading into the Easter break.